I have spent many hours in my attempts to document the parents of my great grandfather, Thomas Gillman Fowler, known all of his life as Gil Fowler. He was born in Union County, SC. The headstone on his grave at Gilead Baptist Church in Jonesville has his date of birth as October 24, 1859, and the date he departed this earth, February 2, 1944. There was another Thomas Gillman Fowler born in Union County in 1798 to Godfrey Fowler and wife Nannie Kelly. This Thomas Gillman was married to Susannah Hames, and they had sons Thomas and Gillman along with several other sons and daughters. It would have been too easy if my Gil Fowler had been one of these sons, but alas, the dates of birth did not line up. So the search for the ancestors of my Gil Fowler began. I began my journey into the past by looking through all of the pages of the Union County, SC census records from 1790 to 1940. This led to the discovery that there were 9 Fowler families who had sons named Thomas or Gilllman born around the time of Gil Fowler. That certainly narrowed it down, but there was much more work to do. Once I sorted through the possible Thomas and Gillman Fowlers, it became very clear to me which one was my ancestor. I learned that his mother’s name was Mary Fowler, and his grandfather was Reuben Fowler. Gillman’s father was not as easy to find. part two: Who were Gil’s parents? Once I had concluded that my Thomas Gillman Fowler was the son of Mary Fowler (b. 1837), and the grandson of Reuben Fowler (b. 1797), I began my search for his father. There is no indication that Mary Fowler ever married. Her son Gil’s death certificate of 1944 lists Thomas Fowler as his father. There were several Thomas Fowlers who lived in Union County at the time of his conception. There was one Thomas Fowler who lived very near the Reuben Fowler household. I believe this Thomas Fowler to be the son of Catherine Fowler (daughter of Henry Ellis Fowler‘s son Mark and his wife Elizabeth Moseley). This Thomas Fowler was born in 1834, and died in1861 at the First Battle of Manassas, Virginia. He was called Thomas “Bunker Hill” Fowler and he is buried at Gilead Baptist Church in Jonesville, SC. There has been a long standing family tradition that Thomas Gillman Fowler was the son of William T. Littlejohn. I only heard this story in recent years, although everyone else in the family seemed to have this information. Not knowing for certain that the father on Gil’s death certificate was recorded correctly, I decided to follow the avenue of possibility that he was a Littlejohn and not a Fowler. Gil was married to Lura Mabry, daughter of Francis and Sarah Watts Mabry. In my research of Lura, I discovered that her mother and father had four children together before 1862 when Francis was killed in the Civil War. Daughter Lura was born in 1865, and four more children were to follow. There was not a new husband in the household after the death of Francis Mabry in 1862. Gil and Lura Mabry Fowler had 17 children. I was able to find the death certificates of several of these children before stumbling upon their son Zebbert Auburn Fowler‘s certificate of death from the 1960’s that listed Lura’s maiden name as Littlejohn. Then, I heard from a Littlejohn descendant that William T. Littlejohn had give Lura over a hundred acres of land. A quick trip to the courthouse confirmed that Lura, and not her husband Gil, had gotten land from William T. Littlejohn. The evidence was piling up that Lura Mabry was the daughter of William T. Littlejohn, and that Thomas Gillman Fowler was not his son! Paper trails are helpful, but I wanted concrete proof. After all, it was a deeply rooted tradition in our small town of Jonesville that Gil’s father was a Littlejohn. So, with the help and a little DNA from a Littlejohn descendant, I had a yDNA test done to compare with my known paternal Fowler yDNA. No match. Gil Fowler was definitely not the son of a Littlejohn. I decided to have the Littlejohn sample tested for an autosomal DNA match. Bingo. The Fowler and the Littlejohn families are very closely related. My theory that Lura was a Littlejohn panned out. I still have no proof regarding Gil’s father, although recent upgrades to the yDNA kits have returned more definite results. It appears that Gil’s father may have been a Cook. After careful analyzing potential Cook men who lived in the vicinity of Mary Fowler, a likely candidate may be Smith Nathaniel Cook (1841-1862). Smith Cook died of typhoid fever in Virginia during the Civil War. Mary Fowler told her son Gil that his father died in the war. I feel like I am on the right path and getting closer to truth. More testing should confirm, or not, this theory which is already somewhat supported with wonderful DNA. part three: Who were Gil’s ancestors? Now that we know Thomas Gillman Fowler was the son of Mary and a yet to be determined father, I want to take a closer look at the entire family, beginning with Mary’s father, Reuben Fowler. Reuben Fowler was born circa 1797, most likely in Union County, SC, and probably a son of Ellis Fowler (b. 1770) and wife Mary (b. 1780). Ellis Fowler (b. 1770) was a son of Henry Ellis Fowler, our first Fowler ancestor to leave Virginia and settle in Union County, SC. Godfrey Butler Fowler, (son of Joseph Fowler, son of Godfrey Fowler, son of Henry Ellis Fowler) was quoted in two books stating that he had heard his great grandfather, Henry Ellis Fowler, had a brother named Reuben Fowler, and that Godfrey B. Fowler’s father Joseph Fowler had a cousin named “little” Reuben Fowler. I believe that “little” Reuben was the father of Mary, Martha, John, Robert and the unknown Fowler daughters of the Reuben Fowler household in 1840, 1850, and 1860. Godfrey B. Fowler’s father Joseph and “little” Reuben would have been first cousins, their fathers Godfrey and Ellis being brothers, both sons of Henry Ellis Fowler. Why do I think that “little” Reuben Fowler was the son of Ellis Fowler?Through wills, and census records, deeds and other documents, we know most if not all of the names of the offspring of Henry Ellis Fowler’s sons. 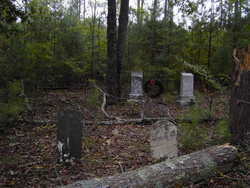 We know that son Ephraim had 10 children and we know their names; Godfrey’s sons and daughters are well documented; Womack’s children, we know; Mark’s family with wife Elizabeth Moseley, we have those also; son William had no children unless one considers the two Burgess girls mentioned in his will to be his; if John “the Hatter” was also a son of Henry Ellis, we know from the hatter’s will that he had one son, Lemuel, and four daughters. The only son of Henry Ellis Fowler who still, for the most part, remains a mystery is Ellis Fowler. Ellis was born in 1770 in Virginia, and married Mary, born 1780 in Virginia. Census records of 1800, and 1820-1850, give us the information that he had a rather large family. The only names of his children that I have been able to document with 100% confidence are sons Ellis (b. 1810), and daughters Nancy (b. 1815) and Winnifred (b. 1822). It is my belief, but not yet proven, that the following individuals may also be the sons of Ellis and Mary: “little” Reuben Fowler (b. 1797); Levy Fowler (b. 1800); Andrew Fowler (b. 1804); and the Thomas G. Fowler (b.1812) married to Martha Owens. Regardless of the parentage of Reuben Fowler (b. 1797), we know that he was living in Union County in 1840 with a wife aged 20-29, and four daughters and one son all under the age of ten. Since all five children were under ten, Reuben and his wife must have begun their family early in the 1830’s. Reuben was living without a wife in 1850, with sons John and Robert, daughters Mary and Martha. Son Robert was five years old, so we know that Reuben’s wife lived at least until 1845. By 1860, son John had married an older woman named Jane and had his own household near his father Reuben. John and Jane had a nine year old daughter named Malissa. Reuben was head of household with daughter Mary and her children, Gillman, and Alice. Reuben’s daughter Martha was also in the household with daughters Francis and Adelaide. Reuben’s son Robert would have been 15 years old, although he was not in the census record of 1860. Other than the three census records mentioned above, I have only been able to find Reuben in one other document. It was from the early 1860’s and was a recorded debt that Reuben Fowler owed someone. Two dollars and fifty cents. Then, Reuben simply disappeared from all records. No deeds, no wills, nothing to indicate that he was alive or dead. The Jonesville census of 1870 for the Reuben Fowler offspring shows two households: one headed by son John, wife Jane, and daughter Malissa; the other headed by Mary Fowler, with sister Martha, and a much enlarged brood that included Mary’s children Gillman, Alice, John, and Robert. Sister Martha had daughters Adelaide and Francis. There was a daughter named Louisa (b. 1869) who probably was the daughter of Martha. Louisa must have died young as she was not recorded in the next census. Reuben’s children had moved from Jonesville to Draytonville by the time the 1880 census rolled around. Reuben’s son John was widowed and lived with daughter Malissa Fowler. Reuben’s daughter Mary had her own household with children Gillman, Alice, John, Robert, and the newest addition to her family, son Jefferson. Reuben’s daughter Martha lived next door to her sister Mary. Martha lived with daughter Adelaide, and daughter Francis, married to Marcus Bryant. Francis and Marcus Bryant had two children by this time, Charles, and Ben. Most interesting to me is that, by 1880, Reuben’s children had moved near Ellis and Sarah Clark Fowler. Ellis was definitely the son of Ellis (b. 1770) and Mary. If Reuben was also a son of Ellis and Mary, then Reuben’s children would have been close to their uncle Ellis. This is not proof that Reuben was a son of Ellis and Mary, but it is darn good circumstantial evidence to me. As an additional note to the above paper trail, I am an autosomal DNA match to several descendants of Henry Ellis Fowler. If Reuben was not a son of Ellis and Mary Fowler, somewhere there is a link from me and my Union County Fowlers to the Patriarch Henry Ellis Fowler. Gil’s sister Alice Fowler (1861-1938) was perhaps his half sister. The certificate of death for Alice Fowler records her father as a Rochester. Alice married David Mitchell (1859-1935), a descendant of the Rev. Elias Mitchell family of Jonesville. Gil’s younger brother, John Fowler, was born in Union County December 3, 1864, and died March 2, 1960 in Lamar County, Mississippi. After many years of searching for John, I finally connected with two of his grandsons who filled in many of the blanks in my research. In an odd twist of fate, I found out that one of his grandsons had contacted members of my own family several years ago searching for Gil’s family! I learned that Gil’s brother John was given a six shooter gun and a five dollar gold piece when he was about 15 years old, and was told that he had to leave home as their mother Mary was unable to feed her family. John traveled west to parts unknown, finally ending up in Alabama where he met and married Miss Erin Josephine Ellison in 1899. They had five sons and one daughter. John and his family moved to Lamar County Mississippi, where he was a farmer and a well respected member of the community. John, Gil, and their sister Alice Fowler Mitchell had some contact throughout the years as there is a wonder photograph of the three siblings taken circa 1920’s-1930’s. His obituary: Lamar County News; Friday, March 4, 1960. John F. Fowler Passes, Service Held Yesterday. Death came to John F. Fowler at 6:45 a.m. Wednesday, March 2, at his home in North Purvis. He had been failing in health for about a year. He was ninety-five years old and was born in Union County, South Carolina December 3, 1864. Mr. Fowler was known affectionately as “Uncle John” by his many friends. He was a farmer and followed his chosen profession until age forced retirement. He loved the soil and things growing. He was a friend to all and was revered by all who knew him. A Baptist in religious faith, he was a deacon since a young man though inactive in later years. He was married to Erin Josephine Ellison December 24, 1899 in North Alabama where they lived for a number of years. With their family of six children they moved to Purvis in 1921, cleared a farm, continued farming and became valued and beloved citizens of the community. Mrs. Fowler died in April of 1959. Survivors are three sons, Ezelle, Glen and Euel, one daughter, Mrs. Omer Elliott, a daughter-in-law, Mrs. Josie Fowler, ten grandchildren and nine great grandchildren. Gil also had brothers Robin and Jefferson. Robert “Robin” was age 11, and Jefferson was age 6 in the last document, the 1880 Union County, SC census, that I have been able to find proving their existence. When Gil’s family moved to Draytonville before the 1880 census was taken, they moved into the neighborhood where the Francis Mabry family lived. Francis was long dead and buried, but his widow Sarah Watts Mabry was living there with her family, which included daughter Lura. Perhaps this is where Gil met Lura for they were married in 1881. Their first son, William M. “Willie” Fowler was born May 11,1882. William married Lora Huss (1895–1972) and they had son Hershel Louie Fowler (1919–1965) and daughter Nedra Loretta Fowler (1926–1994). William died March 29, 1965 in North Carolina, and he was buried in the Cherryville City Memorial Cemetery in Gaston County, North Carolina. Son Claude H Fowler was born in 1883. He worked for the railroad and was living near Lockhart, SC when he was shot and killed in an argument at the local train depot in 1910. It was said in the newspaper that the argument was over one dollar. Claude is buried next to his parents at Gillead Baptist Church in Jonesville. Daughter Minnie Fowler was born in May 1887. She married Robert W Knox (b. 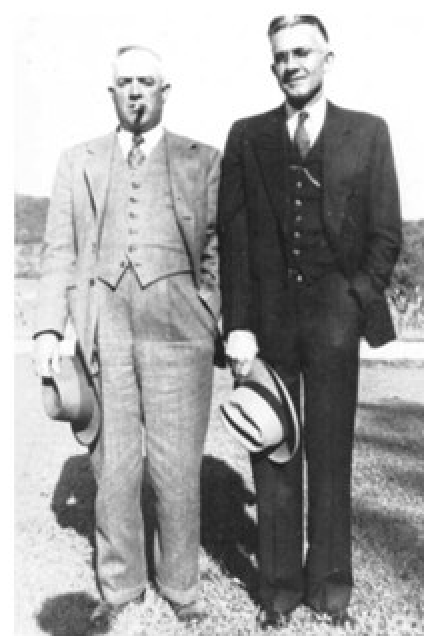 1881) and they had sons William Maurice Knox (1905–1965), and Phippsey T Knox (1907–1966). Minnie died January 28, 1943 in High Point, NC. John Henry Fowler was born May 7, 1888. He married Dealia Dempsey (b. 1893) and their children were Claude L Fowler (1912–1996); Thomas G Fowler Jr. (1919–1996); daughter Wille Rae Fowler (b.1922); and Bobby Dempsey Fowler (1931–2004). John Henry Fowler died January 27, 1938. Gil and Lura had son Zebbert Auburn Fowler on May 8, 1890. Zeb married Grace Mae Faucette (1896–1975). They had children Hilda Graham Fowler (1924–2011); Claudy Auburn Fowler (1928–2008); Cora Nadene Fowler (1931–1993); and Peggy Jean Fowler (b.1933). Zeb died on July 11, 1965 in Burlington, North Carolina. Ezekiel Fowler was born April 21, 1892. He married Mae Pendry (b. 1895). 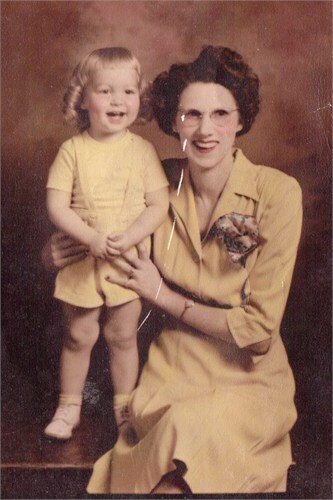 Their children were Jessie Lura Fowler (1914–1998); Woodrow Elvin Fowler (1916–2004); Juanita Fowler ( b.1920); and Pauline Bonnie Fowler (1922–2011). Ezekiel died October 19, 1861 in High Point, North Carolina. My grandfather, Ross Fowler, was born April 24, 1897. He married Lois Mabry (1899-1984). Lois was the daughter of Benjamin Franklin Mabry and Delilah Josephine Foster. The children of Ross and Lois were as follows: Lois Yvonne Fowler (1918–1992); Billy Stowe Fowler (1920–1949); Donald B Fowler (1922–1994); Betty Fowler (1925–2005); Jack Lamar Fowler (1931–1985); Benny Fowler; John Ray Fowler, and Jimmy Dean Fowler, Sr.
Ross Fowler, Patriarch to our Fowler family, died on June 18, 1988. Son Charley Fowler was born in May 1900, and died before 1910. Clyde M Fowler was born June 4, 1901. He married and had two sons. Clyde moved to Chicago and lost touch with the family. No information has been found. The youngest son of Gil and Lura was Ebber McMillan Fowler, born May 1, 1903. Ebber was a preacher, and he was married to Della James (1906–1999). 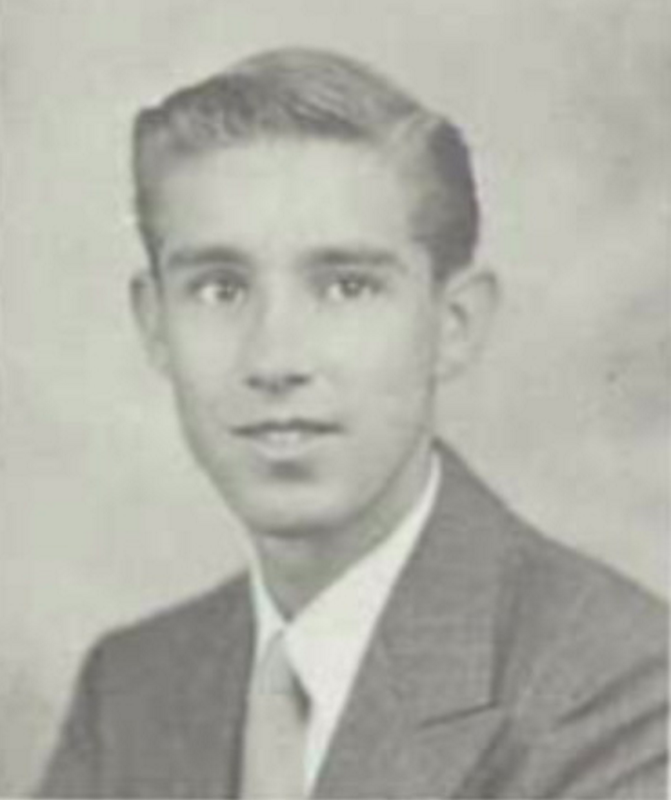 They had sons Donald Ray Fowler (1930–2008) and Phillip James Fowler (b.1938). Ebber died on September 7, 1962 in Asheboro, Randolph County, North Carolina. In the 1900 census, it was recorded that Gil and Lura had 12 children with 8 still living. Not only were the eight children were living, but they were still living at home: 18 year old Willie, 17 year old Claude, 13 year old daughter Minnie, 12 year old John Henry, 10 year old Zebert, 8 year old Ezekiel, 3 year old Ross, and newborn son Charley. There were four children born somewhere in between these surviving children who had died before 1900. In 1910, it is recorded on the census that Gil and Lura had 17 children with 9 still living. This means that they had had five more children after 1900 and before 1910. Willie, Minnie, and John Henry were still alive and well in 1910, but had already moved out of the household. Son Claude did not die in the shooting at Lockhart until December, 1910, well after the census was taken in April. Sons Zebbert, Ezekiel, and Ross were living with Gil and Lura with the addition of two more brothers born since 1900: Clyde and Ebber. That adds up to 9 living children in 1910. Four young children had died before 1900. The infant son Charley of 1900 did not survive until 1910. Three of the children born after 1900 did not live until the decade’s end. Martha Fowler, daughter of Reuben and sister to Gil’s mother Mary, had two daughters who survived to adulthood, married, and had children of their own: Francis Melinda Fowler and Mary Jane Adelaide “Addie” Fowler. Francis Melinda Fowler and Mark Fowler were living with her mother Martha Fowler in Draytonville, (Union County, SC 1880 census). They had two children: one year old Charles Fowler, and 8 month old Ben Fowler. The above statement is very profound as well as a big leap of faith on my part. I would be remiss if I did not offer an explanation and proof to back up my claim. Mark Fowler was the son of Ellis Fowler (1803-before 1870) and Jane Hodge (1826-after 1880). Ellis Fowler was the son of Mark Fowler son of Henry Ellis Fowler) and Elizabeth Moseley (daughter of James Moseley). Jane Hodge was the daughter of John Jackson Hodge and Martha Patsy Fowler (daughter of Womack Fowler who was a son of Henry Ellis Fowler). Martha Patsy Fowler’s mother was Susannah Moseley (daughter of James Moseley). It goes without saying that Ellis Fowler and his wife Jane Hodge were related to each other through both the Fowler and Moseley lines. They were double cousins as well as husband and wife. They had two children, Mark and Martha. Martha Fowler married Felix Quinn, and this couple had children together. Martha’s brother Mark Fowler had two sons, Charles and Ben, before 1880 with Francis Melinda Fowler, who was also a cousin through her descent from Reuben Fowler. It would take an expert to figure out the degree of relation that Mark and Francis Melinda were to each other. It is very complicated, all of the above, and DNA testing might help sort it out and would most definitely confirm that the two older children of Francis Melinda Fowler were, in fact, the children of Mark Fowler and not Marcus Bryant. Mary Fowler 53 (head of household) daughter of Reuben Fowler b. 1797. Adelaide Fowler 20 (sister) daughter of Martha; her name was Mary Jane Adelaide Fowler and she married Smith Robert Cook; she would have been the sister in law to Mark Fowler. At some point after the 1880 census, Mark Fowler exited the household, and Francis Melinda Fowler married Marcus C. Bryant. There appears to be a gap in the birth of her children of about four years, so my best guess is that the remainder of her children were the children of Marcus Bryant. Again, DNA testing would put this to rest. Charles Landrum Bryant (March 3, 1882-June 11, 1945) Probable son of Mark Fowler, although possibly informally adopted by Marcus Bryant. The date listed for his birth on his death certificate is incorrect as he was counted in the 1880 census as Charles Fowler. Charles L. Bryant married Elliott Beona Vinson (1882-1960) in 1906. They were living in Union County in 1910 with their sons Charles L. Bryant (1907-1967) and William M. Bryant (b. 1909). In 1920, Charles was working as an insurance salesman. He and Beona lived in Spartanburg, SC and had four sons: Charles L. Bryant, William Bryant, Phillip Lee Bryant (b. 1911), and Hugh R. Bryant (1914-1967). 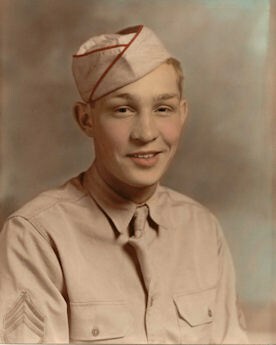 Charles Landrum Bryant died in High Point, NC on June 11, 1945. Ben Frontes Bryant (October 19, 1883-September 1, 1943) Probably son of Mark Fowler although possibly informally adopted by Marcus Bryant. The date of birth is incorrect as he was also listed on the 1880 Union County census as Ben Fowler. Ben married Elizabeth Mabrey (b. 1890) in 1907. They are listed in the Spartanburg, SC 1920 census with son Buford Benjamin Bryant (1908-1984), daughter Elizabeth Bryant (b. 1917), and son James Patrick Bryant (1920-1972). Ben and Elizabeth are found in the 1940 Graham Burlington, NC census with daughters Elece Bryant (b. 1924), Lennie Bryant (b. 1928), and son Richard Bryant (b. 1930). Ben F. Bryant died in North Carolina on September 1, 1943. Oscar d. Bryant (January 1883-October 12, 1936) As per the 1910 census, Oscar was living in Jonesville, SC with his wife “Wannies” (Nannie?) (b.1887) and their son Paul Bryant (b.1910). Living in the household was also 6 year old Lincoln Mitchell. Living next door to the Oscar Bryant family were Mary Fowler’s daughter Alice Fowler and husband David Mitchell. Lincoln was the son of Ola Mitchell, daughter of Alice Fowler and David Mitchell. Ola Mitchell later married John Henry Nelson, and Lincoln Mitchell became Lincoln Nelson. In 1917/1918, Oscar Bryant filled out a draft application for WW I and he is listed as a county convict living in Charlotte, NC. The application stated that he had a wife and 2 children. Oscar was out of jail and was living with his parents and siblings at 136 Crescent, Spartanburg, SC in 1934. HIs death certificate listed that his date of death as October 12, 1936; Spartanburg, SC; married. Johnson Ezell Bryant (March 27, 1885-October 1, 1958) In 1910, Ezell was living with his parents, brother Montsenieur, sisters Leila, Eva, Isabel, Agnes, and her husband Kim Belcher. On his draft applicatin in 1918, Ezell was married to Kitty Holder, lived at 136 Crescent, Spartanburg, SC, and had lost his left eye. In 1930, Johnson Ezell Bryant was counted on the Spartanburg, SC census with 29 year old wife Kitty, and 4 year old son Algie. On the 1940 Spartanburg, SC census, Ezell J. Bryant lived with wife Kitty (aged 50) and son Algie (aged 14) on South Church Street, Spartanburg, SC. Ezell and Kitty had married when she was 24 years old. Ezell died at age 73 on October 1, 1958. He was living at 158 Seay Street at the time of his death, and he was a widower. Ezell’s occupation was “retired worker at a hosiery mill”. His son, Algie Bryant, lived in Spartanburg and was the informant on the death certificate. Leila Bryant (1887-1962?) 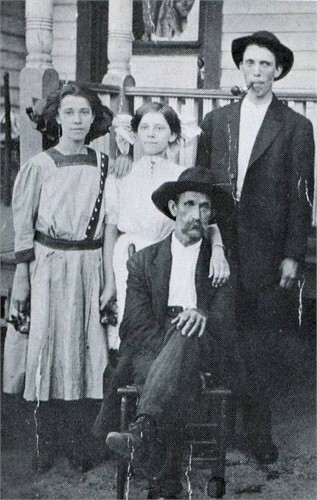 Leila lived in Spartanburg, SC in 1910 with her parents and siblings. She lived with her parents in 1920 and 1930. She was 54 years old in 1940 and lived with her sister Isabel Bryant at 136 Crescent, Spartanburg, SC. Agnes Bryant (March 15, 1890-August 19, 1971) In 1910, Agnes lived in Spartanburg, SC with her parents, siblings, and her husband Enoch Kinney “Kim” Belcher (1888-1951), son of Enoch and Marriott Holland Belcher. Agnes and Enoch were married in Gaffney, SC. In 1920, Agnes and husband Enoch lived in Spartanburg, SC with their children Leonard, Loise, LeRoy, and Joe. Enoch worked as a chauffer. The family had moved to Gaffney, SC by 1835, and they lived there during the enumeration of the 1940 census with children LeRoy, Ruth, Dorthy, Jessie, and Willie Mae. Agnes Bryant Belcher died August 19, 1971 and was buried at Greenlawn Cemetery in Spartanburg, SC. Private of 145 Depot Brigade. Funeral services and burial of Montsenius Bryant, 37, son of Mr. and Mrs. M.C. 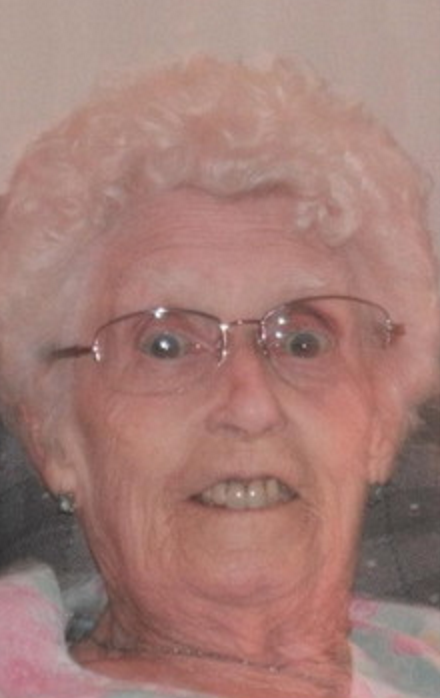 Bryant, 126 Crescent Avenue, who died in a government hospital in Johnson City, Tenn. will be held Friday. Services will take place in Spartanburg at a date to be announced later. The body was brought here yesterday. He is survived by his parents and the following brothers and sisters: Ezell Bryant, High Point, NC; Charles Bryant, Ben F. Bryant, and Oscar D. Bryant, Spartanburg; Mrs. K.P. Belcher, Spartanburg; Misses Isabel and Leila Bryant, Spartanburg; and Mrs. Eve Boozer, High Point, NC. His sister Isabel Bryant signed an application in March 1932 for a Veteran’s headstone for his grave at Gilead Baptst Church in Jonesville. 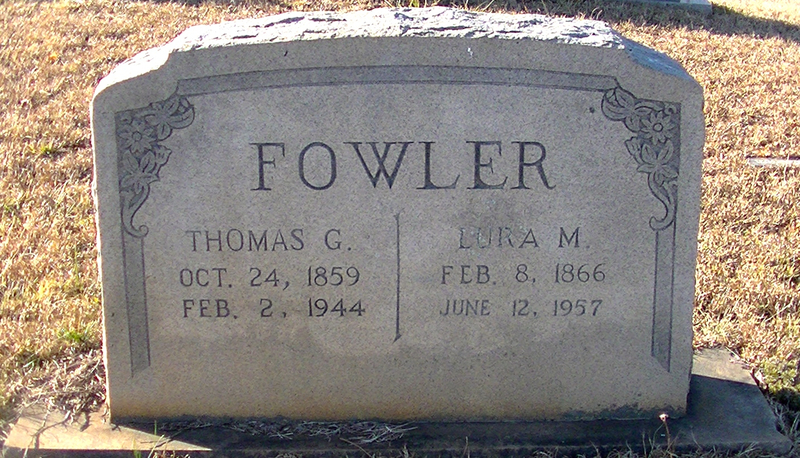 The headstone was shipped to John Henry Fowler, son of Thomas Gillman and Lura Mabry Fower, of Jonesville. Eva Lenora Bryant (November 30, 1897-May 11, 1987) Eva’s sister Leila M. Bryant signed a birth certificate document on April 28, 1945 stating the date of birth for her younger sister Eva. Eva married Joseph S. Boozer and they lived in High Point, NC in 1930 with her nephew Buford Bryant, son of her brother Ben Bryant and Elizabeth Mabrey. In 1838, they lived at 410 Barker Street in High Point. They lived in High Point during the time of the 1940 census. Eva died on May 11, 1987 in South Port, NC. Isabel Bryant (1899-March 1972) Isabel never married. She lived with her parents in 1910, 1920, and 1930, and with her sister Leila Bryant in 1940. Isabel died in March 1972 in Spartanburg, SC. Mary Jane Adelaide “Addie” Fowler (1862-February 3, 1919) married Robert Smith Cook (1865-1912) Robert Smith Cook was the son of Alfred and Elizabeth Bentley Cook. Adelaide Fowler, daughter of Martha Fowler and Robert Dunlap, was married to Robert Smith Cook in 1887. They appeared in the 1900 Union County census living with their children Mattie, Della, Clarkson, Alfred Smith, and Jennie. In the 1910 census, they had the following children: Beluh, Clarkson, Smith, Bessie, and Grace. Clarkson Nathaniel Cook (1893-1953): Clarkson N. Cook married Vera Dean (1899-1939) and they had at least three daughters: Vera Shirley Cook (1923-2004); Fannie Lee Cook (1925-1998); and Beverly Dean Cook (1928-1961). Alfred Smith Cook (1897-1965): Alfred Smith Cook married Emma Poore (1911-1996). He died in NC in 1964. William T.A. Littlejohn (1875-1956) signed documents in 1946 for a delayed birth certificates for Clarkson N. Cook and his brother Alfred Smith Cook. Herbert Fowler, (son of Rufus Fowler? and Alice G. Foster?) also signed these documents. Bessie Lee Cook (1900-1966): I believe Bessie was the daughter called Jennie in the 1900 census. Bessie married Horace Andrew Sawyer (1887-1954). They lived in Union County in 1920, and they were living in Buncombe, NC in 1930 and 1940. Helen Grace Cook (1902-1981): Helen married Henry C. Patterson (1897-1975) and they adopted son Billy Eugene Patterson (1924-1964). Reuben’s son, John Fowler, brother to Mary and Martha, had married a woman named Jane by 1860. Census records over the years have his date of birth spanning from 1835 to 1838. Wife Jane was born in the mid to late 1820’s. Daughter Malissa was born between 1851 to 1853. By 1880, Jane had died and John lived with daughter Malissa and a young woman named Francis Hall. There is a John R. Fowler and wife Francis in the township of Cowpens, Spartanburg County, SC 1900 census. They had been married in 1882 and had no children. I believe this to be John Fowler, son of Reuben. I discovered a headstone at Gilead with the inscription ” John Fowler Co F 15th SC Inf CSA“ beside the graves of Marcus and Francis Fowler Bryant, and that of Montsenieur Bryant. If this is the last resting place of Reuben’s son John, we now know that he served in the Civil War. There are no dates of birth or death on the stone. The location of the grave leads me to believe that this could be our John, considering that Francis Fowler Bryant was the daughter of John’s sister Martha. The photos below are that of a front view of the stone, and from behind showing the Confederate marker……..
My dad was born in 1938, and he remembers his grandfather Gil. I feel very fortunate that my dad has shared his memories with me. When I think about the past, as I often do, I wonder how life was for these ancestors of mine. I am amazed when I realize that my dad knew Gil, and that Gil would have known his grandfather Reuben, and that perhaps Reuben remembered his grandfather Henry Ellis Fowler. It is a link to the past, a sort of oral history that is passed from one generation to the next, a sense of connection to my roots. It is something that I cannot explain, but it is something that is very much a part of me and who I am today. My father was just shy of six years old when Gil died in 1944. Thomas Gillman Fowler died on February 2, 1944, and was laid to rest at Gillead Baptist Church cemetery on February 4. His wife Lura Mabry Fowler mother of his seventeen children, died June 12, 1957. His life was probably difficult at times, as were the many lives of the early settlers scratching a living out of the red clay earth of the Carolinas. He left a legacy in us, his sons and daughter, and their children’s children. He is not forgotten. He is one of the reasons that I exist. I dedicate this to my great grandfather Gil Fowler. I am thankful to him for the gifts he gave our family. One man from long ago, Thomas Gilllman Fowler, a Life. Attempting to determine my paternal heritage…DNA testing points to possible Fowler link. Can anyone help me see if this is a possibility. All folks in and around Union, SC.